Cupboards Kitchen and Bath: It's okay to say "No." It's okay to say "No." It's no secret that I believe hiring a designer will almost always help a home improvement project go more smoothly and cost less money. Sure there are lots of things that are DIY-friendly that don't require a design service, but once you start a moderate to large project the value of a designer really starts to shine through. As a kitchen and bath professional, we tread in a unique middle ground of the design/build industry. Certainly, there are interior designers who design kitchens and kitchen design firms that function wholly as contractors. Being in the middle has afforded me the opportunity to work with just about every type of industry professional from architects, builders and contractors to interior designers and even decorators. While I have no intention of stepping on any one's toes, I'm sure this will. My design friends need not take offense, it's merely an observation and reaction to the same. Many people in our industry have very strong personalities(me, included). We don't always realize that our confidence and suggestions come across the table as demands. Bottom line: Sometimes designers don't know what you want and you, the customer, needs to speak up. There could be a couple of reasons that a designer might miss the mark and you try your best not to furl your brow as you see the proposal. Perhaps you weren't clear on what you asked for, or perhaps you didn't know what you wanted but you didn't realize that weren't going to like what would be proposed. Designers can be intimidating. After all, you expect them to be on the cutting edge of trends and features and when they put a plan in front of you that's the furthest from expected it's okay to say that you don't like it. A professional designer will probably pepper you with more questions to see what you do and don't like from the proposal and you need to be prepared to answer. Designers want you to be happy, but you have to be prepared to meet them halfway on the communication highway. Good lines of communication will allow open dialogue where "no" isn't going to be an ugly word. You may even have an idea that seems great but when you pitch it to your designer, he or she says, "No, logistically and structurally that just won't work. Here is an alternative that we might be able to accompish." See? "No" isn't so bad. 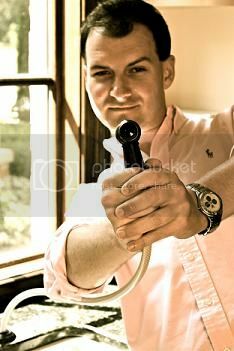 So, if you're a homeowner that hires a designer to "handle it" then this isn't for you. If you hire a designer to work with you to create a space in your home, work with them. It's not a one-way street. Be empowered! 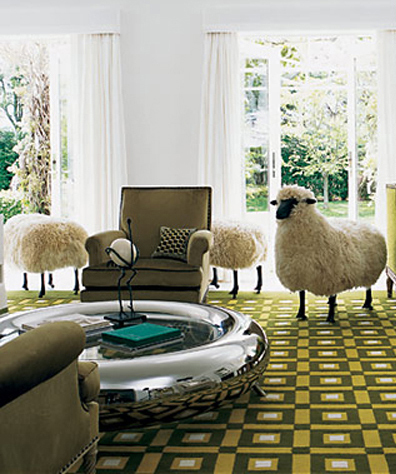 If you aren't paying attention, you could just end up with sheep in your living room. It's hard to be empowered sometimes against professionals! It usually takes a good pep talk, a shot of tequila and a very tall pair of heels to make me feel powerful enough. I understand completely about thinking something might be cool until you see it... Been there, done that. Empowerment isn't always easy. I really try to be encouraging! Pep talks are key. But seriously, your post is dead on. I read a post somewhere long ago where the client was so dismayed by the end result, after having spend some $100K on a redesign, that she cried wolf via several very public forums, warning that working with designers was very bad. Anyway, multiple designers (and when I mean multiple, I mean the Twittersphere lit up...) questioned whether or not she (the client) had a) asked questions, b) approved specs, or c) said "I don't really like this" before a purchase was made, she became very quiet. Clients, existing and potential, have to speak up. During an initial consult I tell my potentials that I may very well be rather quiet for a good majority of the meeting. I could be spouting ideas or commentary but what good would that do for either of us in the long run (or the short run if I don't land the job). ON a side note... the biggest thing clients need to be brave about talking about is the big bad B word... You got it... BUDGET. I know it's scary but it must be said. Great comment, Brandon- and don't you worry... the B word post is coming! Excellent post! Well said, Nick. The key to success in any relationship is communication which includes speaking clearly and listening well - by both parties. Put emotions aside and hash out the details. And, if you can't? Remember, sometimes relationships don't work out and it takes two mature people to admit it isn't working and graciously move on. HINT: Do this before you start construction or buying anything. Clients, if you don't know what you want; but, want a change, tell your professional before you start. That's a very different project and requires a different approach and more time than someone walking in with a few photo's saying, "I want to remodel my kitchen like this..." And, that really impacts the B word (AKA BUDGET) mentioned above. In the end, it's the excellent exchange of ideas that creates success. And, give it some time - it doesn't happen overnight. I had my kitchen remodeled ten years ago and I still love everything about it everyday! I worked with a designer and highly recommend the process. Thanks a lot for the comment, Bill- It's so important to be open about details... it's also the responsibility for designers to be approachable and listen. All the way a two-way street! No designer worth their salt wants a dismayed or unhappy client at the end of a project. Couldn't agree more, Kelly- I'm sad to say that I've run across more than a couple of designers who are more concerned with "stamping" a project with their trademark than finding a way to make the space work for a homeowner. There are certainly those customers out there that want a certain designers flair on permanent display, but the last thing I like to see is it be forced on a client aware or otherwise. Not much more to add here Nick. I'm currently working with two very different personality types, but they both have given me feedback to help steer the project into something that, as Kelly put it, will make them deliriously-out-of-their-minds happy. I know I'm going to sound like a broken record, but we work in a communications business. Part of our job is to foster communication with the client so we can find out all the likes and dislikes. True, the customer has to open up. But a good designer can help a customer feel like they can open up too. Totally agree, Arne- and I really can't believe that everyone likes the sheep. Guess I'll need to do better on the picture next time! Nick, I think that between your post and the comments, everything has been covered. I tell my customers that if they don't like something that I propose or have designed, to please tell me. It won't offend me, hurt my feelings or anything else. It is just one idea and between us, I am sure that we can come up with one or more ideas they will like. BTW, I like the sheep too, just not sure where they would fit in, though. I do like the cool coffee table, too. Old MacDonald had a... Bathtub?